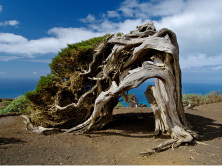 If you are travelling to La Graciosa in the Canary Islands, the following information may help by giving you an overview on the island . La Graciosa is one of the Canary Island’s best kept secrets, with its stunning beaches of soft, pale sand and clear, crystal waters with barely a soul to be seen anywhere. Dubbed the “gracious islands” by Jean de Bethencourt, La Graciosa holidays are recommended for the ultimate stess-busting break. A day should do it – anything longer being strictly for the keenest surfers [and the surfing here is world-class] or for those seeking longer-term peace and quiet. La Graciosa island is separated from Lanzarote’s northern tip by the narrow strait of El Rio, and the ultimate desert island getaway, for those looking to escape the pressures of modern life. To get across to La Graciosa, head for Orzola, the northermost point on Lanzarote. The ferry crosses to La Graciosa island from here [sea permitting]. 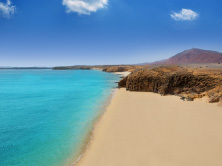 There are no direct flights to La Graciosa so it is best to fly into Lanzarote and then catch the ferry. 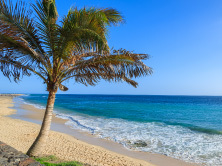 There are no roads at all on the island – just a few dirt tracks – so there is no traffic whatsoever, with the exception of a few four-wheeled drive vehicles belonging to some of the locals. The island measures just 27 square km and can be explored easily on foot or by mountain bike. After a couple of days here, you will be adjusted to the unhurried way of life. La Graciosa’s population is just 600, all living in the island’s only village, Caleta del Sebo, where the ferry from Lanzarote docks. Whilst on your La Graciosa holidays, you can enjoy the handful of simple restaurants down by the harbour, with the freshest fish and seafood for lunch and dinner. The village has a couple of mini-markets for basic requirements, along with some places to rent bikes and a small medical centre. 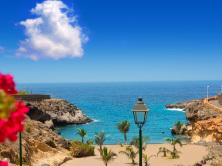 On a windy day, Caleta del Sebo can seem a cross between a bare Moroccan village and a sand-swept Wild West outpost – this place is worlds away from the tourist mainstream!! Beyond the village, construction is not allowed whatsoever, as the whole island is a nature reserve. Because of this, the island’s beaches are completely unspoilt. 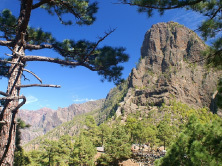 Behind Caleta del Sebo is 27 sq km of largely barren scrubland, interrupted by five minor volcanic peaks. 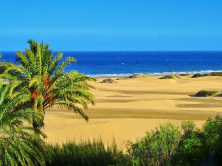 For a quick dip, the village beach is more than satisfactory, but the fun of La Graciosa holidays is to just walk along the coast and stop wherever you feel like it. 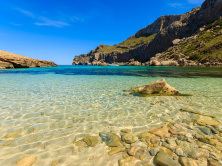 [Should you wish to stay the whole day on the beach, please carry sufficient water and a picnic, as there are no facilities outside the village]. La Graciosa is an ideal choice for the beach lover with the most famous beach, Playa de las Conchas, a good hour’s walk from the village and can sometimes suffer from strong currents and waves, but other equally beautiful beaches closer to the village include Playa Francesa [30 minute walk away] and Playa de las Cocinas, both of which are sheltered and have stunning views back towards the Famara cliffs on Lanzarote. La Graciosa forms the Chinijo archipelago, together with four even smaller uninhabited islands, and is the largest protected marine reserve in Europe, so if you get tired of the beach, you can discover the sea on a glass bottom boat, take a boat trip to the smaller islands or join a deep-sea fishing expedition. The fish soup with gofio escalado, or lightly grilled caught fish with small potatoes and a hot sauce is recommended. 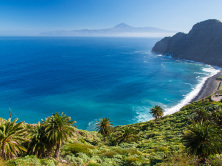 Many tourists travel to La Graciosa, Canary Islands to sample the delicious seafood paella or the traditional stew. You can reserve a table in any of the restaurants in Caleta del Sebo in the morning for the same day, to avoid long and unnecessary queues.